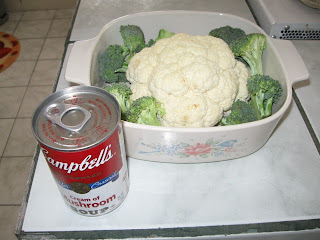 I tried quincy's cauliflower trick today with a few mods of my own. Q already went through the basics, so I will just comment quickly on what I did differently. First and foremost is the secret ingredient: Campbell's Cream of Mushroom Soup. 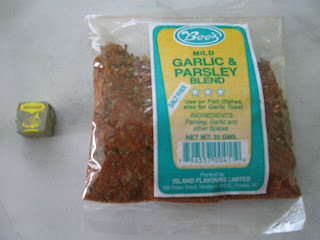 Q and baidawi once advised me to use this as a cheese sauce stretcher in macaroni pie and lasagna. I haven't made a cheese sauce without it since. It adds a good thickness to your sauce, and a rich taste. It's available with less sodium...look for the green tin. I wanted to season up my sauce a little as well, so I used some Garlic & Parsley Blend and a Maggi Garlic & Onion cube (mostly because I couldn't decide which one to go with) along with the salt and black pepper quincy recommended. I also used a little sweet basil. You will find out over time that I like to pack my food up with plenty ingredients. Cooking with fewer ingredients is good when you want to savor the flavor of one main ingredient, but...I'm de fella who must take everything with a Subway, for the taste explosion. So I ended up with this. 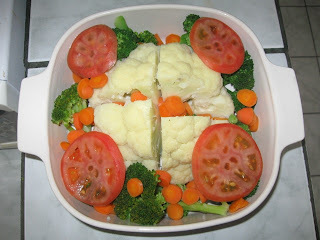 Cauliflower, broccoli, carrots and tomato. I decided to leave out the corn because I didn't think there'd be enough space for the sauce. This was the final result. I put a small handful of diced cheese (too lazy to grate) straight into the sauce. You really won't need much. 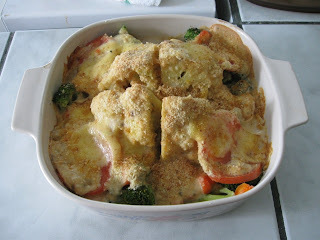 I sprinkled some parmesan and bread crumbs on top. And here's the plate. It went down well with some fish sticks. Tell me how yours turns out. well, as the official taster of this dish, I completely enjoyed it! 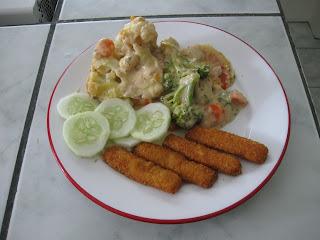 The sauce was rich, the cauliflower still had a nice bite to it and I was glad there were other veggies available to eat. I feel satisfied but not stuffed. the end result look real good. presentation on point!! personally, i don't like hot tomato though. but de broccoli and carrots nice. not to mention cream of mushroom soup dawg!! a winner every time right??! Very interesting Kayode. I'm no cauliflower fan but I would definitely try that!